The Smok GX2/4 350W TC Starter Kit is a cutting-edge sub ohm starter kit for liquids that combines the ever so popular TFV8 Big Baby atomizer with the innovative GX2/4 temperature control box mod. The GX2/4 TC Mod is an advanced high output box mod that comes equipped with both variable wattage and temperature control output modes. This device includes two different battery door covers that can be interchanged to allow for either dual or quad cell set ups, allowing you to customize the device to match your current preference. This device features a power output range of 6-220W or while using quad 18650's it will reach an output as high as 350W of power. In variable wattage mode this mod will support kanthal or SS atomizers rated anywhere from 0.1-3.0O or in temperature control mode it can accommodate SS, Ni200, Ti atomizers within the range of 0.06-3.0O, leaving you with a versatile device that can handle nearly any coil your throw at it. Smok's GX2/4 350W TC Mod also features an extra large detailed OLED display screen with individual battery life indicators, a convenient squeeze style firing mechanism and a user-friendly upgradeable firmware allows you to keep this device constantly up to date with all of Smok Tech's latest features and specs. The TFV8 Big Baby Sub Ohm Tank from Smok is the smaller yet just as powerful version of the original TFV8 cloud beast atomizer. 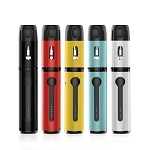 This slim 24.5mm atomizer features a strong stainless steel construction with Pyrex glass tube section that can hold up to 5mL of liquid at a time. An innovative hinge and lock top fill system allows you to quickly refill in just a few seconds with very possibility of leakage. Once all filled up this top cap securely locks into place, allowing you to throw your vape into a pants or jacket pocket and travel with peace of mind knowing you are not leaking your precious liquids everywhere you go. This tank also features a wide bore 14mm delrin drip tip, a dual adjustable airflow control system with large airflow channels that grant your full control over the quality of your vapor, and Smok Tech includes two of the TFV8 Baby atomizers ready to vape right out of the box. 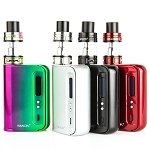 Please note the Smok GX2/4 350W TC Starter Kit requires at least two high amp 18650 batteries and an external 18650 charger is required because the GX2/4's USB port only allows for firmware upgrades. If you need to purchase these items you can include them with your order by selecting one of the Add 18650 Batteries and Add Dual Charger options, if you any questions about these items please contact our customer service line during normal business hours for assistance.